Created in collaboration with filmmaker Josh Halverson for the 2017 Milwaukee Fringe Festival. This piece was premiered as part of Two 2 Duet, a concert of duet collaborations produced, choreographed and danced by Christal Wagner and Gina Laurenzi. In collaboration with Milwaukee Opera Theatre and Quasimondo Physical Theatre, performed at Milwaukee's Tripoli Shrine Center, January 20-29, 2017. Premiered at the Inaugural Milwaukee Fringe Festival in August 2016, "MKE Imparts" uses recordings of Milwaukee's intimate and public spaces, setting a seamless backdrop for live music and dance. Cellist Alicia Storin and flutist Emma Koi are moveable elements in this piece, while dancer/choreographer Christal Wagner weaves in elements of quiet repetition and loud improvisation. A portrait of our city, our home, Milwaukee, Wisconsin. of the Eagles Ballroom as it existed in the 1940's and 50's. Thank you to SSRC Director Elizabeth Price for her support and help arranging these interviews. Presented in collaboration with Danceworks Performance Company for the March, 2015 show "Breathe", Tidal explores the relationship between breath, water, sound and movement. Using the actual musical score as a roadmap for choreography, Cadance Collective assigns dance phrase material to each musical phrase in this adaptation of the prelude from J.S. Bach's Cello Suite No. 2 in D minor. 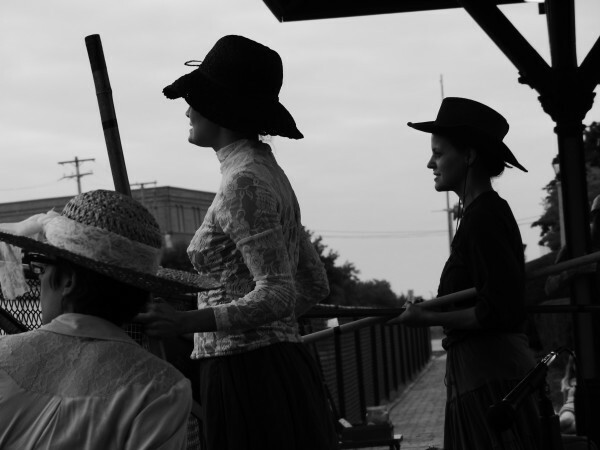 Presented as part of South Milwaukee's pop-up performance "Drama at the Depot", made possible by the South Milwaukee Performing Arts Center and The Battery Factory, Cadance Collective's "Folk Suite" includes musical and choreographic adaptations of three popular folk tunes, "Clemintine", "Wayfaring Stranger" and "I've Been Workin' on the Railroad". Created for Danceworks' GET IT OUT THERE concert. The trio uses the folk song Wayfaring Stranger to inspire deep investigation into acceptance of confinement and the goal of reaching a higher place. Composed and choreographed for Danceworks concert, Intersect. This work features an underlying soundscape of the trio's voices in candid discussion about their deepest desires as artists. In the foreground is an original composition for flute and cello paired with whimsical choreography for two. In Cadance Collective’s premier work, "Aeriform", the group uses a musical landscape morphed out of themes from J.S. Bach's Cello Suite No. 1, The Swan and The Aviary from Camille Saint-Saens' Carnival of the Animals. These musical motifs inform birdlike movement as wings learn to unfold with open eyes to the possibility of flight. Cellist Alicia Storin’s captivating interpretation of The Swan transforms itself into a pas de deux with familiar melodies from the Prelude of J.S. Bach’s Cello Suite No. 1. Christal Wagner’s choreography utilizes Emma Koi’s ability to transform from dancer to flutist seamlessly in a spirited journey to flight.